Carli Lloyd led the American attack by scoring both goals. Hope Solo maintained a solid defense of the goal, with spectacular saves on two tough shots. 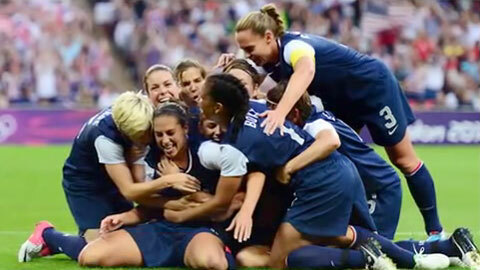 By beating Japan, Team USA received redemption against the team that defeated them in the heartbreaking World Cup Final that Japan won on penalty kicks last year. These two teams are undoubtedly one of the best rivalries ever. The U.S. Women’s Soccer Team now maintain their perfect record dating back three Olympic Games and with this gold medal win, Team USA will be guaranteed a 10-game victory tour in the United States. Japan won Silver and Canada won Bronze. PFP Sports and Celebrity Talent Agency is a speakers bureau and top booking agent for Olympic speakers, athlete appearances and endorsements. If you would like to find out how to contact or hire Hope Solo, Abby Wambach, Alex Morgan or Carli Lloyd for an appearance, endorsement deal, autograph signing or special event, request speaker fee and booking agent information from PFP Sports and Celebrity Talent Agency or call 800.966.1380.